Crosswalk flags, like these placed by ioby leader Sarah Newstok in Memphis, don’t cost much but have a big impact on safety. 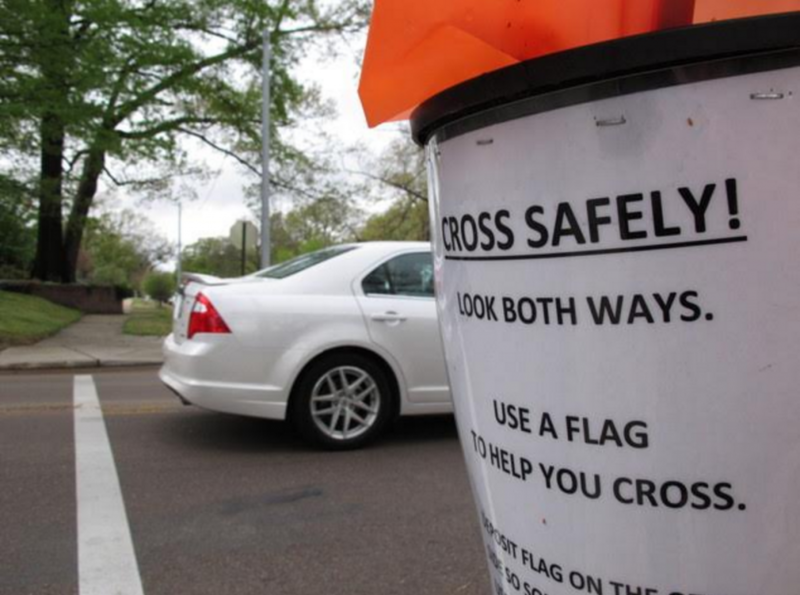 Memphian Sarah Newstok raised $543 on ioby to install crosswalk flags at a busy intersection in her neighborhood that drivers routinely sped through, scaring and endangering pedestrians. Now, before peds cross the street, they can pick up a brightly-colored, reusable flag from a bucket zip-tied to a nearby pole. They wave the flag while crossing for increased visibility, then deposit it on the other side for the next person. 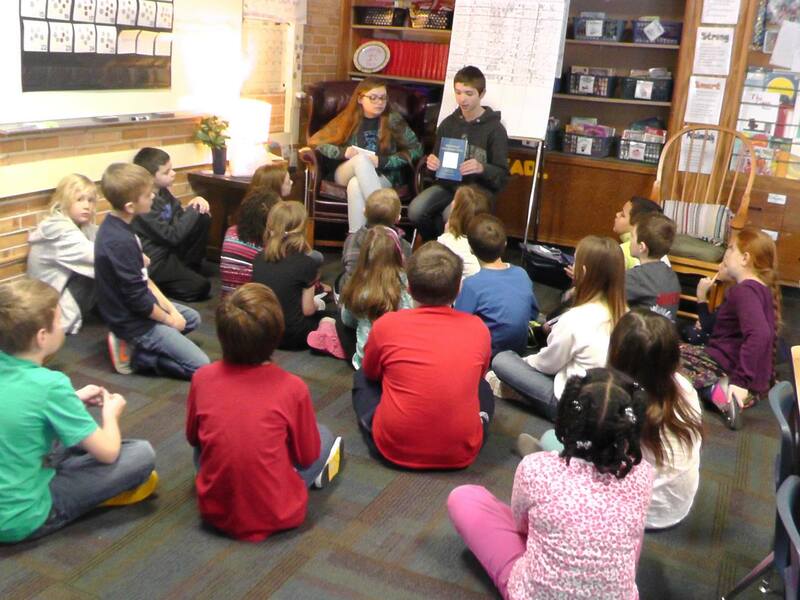 A group of students at Whitehall Middle School in Whitehall, Michigan wrote and self-published a children’s book about the negative impacts of microbead pollution in the Great Lakes. The young scholars titled the book Billy the Bluegill and the Microbead Mishap and distributed it for free to all 81 third grade classrooms in their county. The students said they believed that if they could educate younger kids about how their consumer choices make a difference to the environment, their parents would also get the message. For the low price tag of $572—and some help from campaigns on Facebook and Twitter—the book became available nationwide. In the same year, two Michigan senators proposed legislation which would phase out the use of microbeads. Coincidence? Students at Ealy Elementary School reading a book written by their peers at Whitehall Middle School about the negative impacts of microbeads. In the words of project leader Austin B, “One of the things that can make a neighborhood safer is when neighbors know one another and can look out for each other.” Austin’s project set out to connect and strengthen relationships between as many neighbors as possible by giving people from all backgrounds a fun reason to come together: carving pumpkins to decorate their street. By pooling $328, Austin’s neighbors got a plethora of pumpkins, all the necessary carving supplies, and tasty refreshments. We’d bet they had some fun and made some new friends, too. And at such a price, they could hold a carving day every fall. When Maxine Smith STEAM Academy, a Memphis middle school, was in its first year of operation, a group of parents, students, and staff rallied to brighten up the front of their building. They decided to do so using solar-powered flood lights—an inexpensive and green option—and to install them on an already-scheduled school clean-up day. The result? Increased safety and nicer aesthetics—with a side of team building—all for $515. Green Acres Community Gardens crowdfunded to expand a small yard to give their hens–and their neighborhood fans–more space. Brooklyn’s Green Acres Community Garden has a large membership—and even more admirers. Everyone who passes by can enjoy the pleasing sights of the fruits, vegetables, flowers, herbs, goldfish, and chickens they tend. 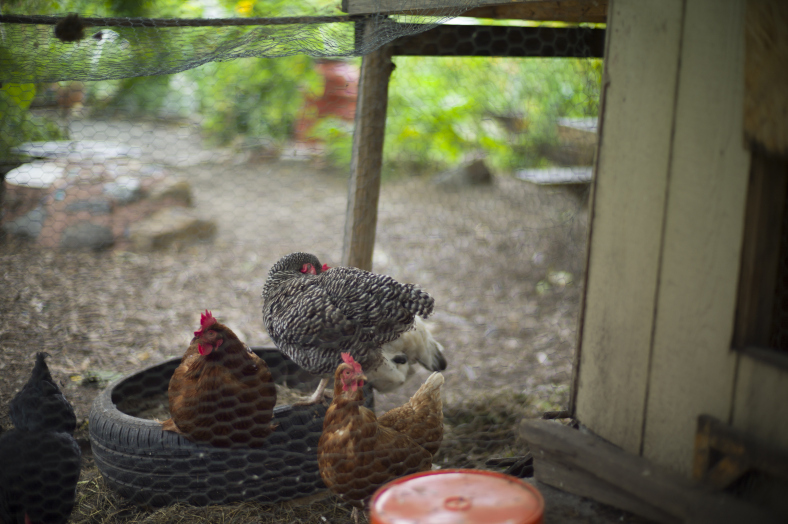 The garden raised $273 on ioby to buy the necessary materials (chicken wire, paint, screws, etc) to expand the hens’ small yard, giving them—and their fans—a larger, more comfortable, and cleaner space to eat, play, and socialize in. For more on the many reasons “Lighter, Quicker, Cheaper” community actions often punch above their weight, check out this article from our friends at Project for Public Spaces. We also love Curbed’s 101 small ways you can improve your city. Do YOU have a big idea for a small-budget project? Tell us about it—we want to help!